Start with the crust. In a food processor fitted with the steel blade, pulse together the flour and salt. Add butter and vegetable shortening and pulse until the mixture forms chickpea-size pieces. Combine egg yolk, vinegar, and ice water and add 1 tablespoon at a time until the dough just comes together. It should be moist but not wet. On a lightly floured surface, gather the dough into a ball. Flatten into a disk with the heel of your hand. Cover tightly with plastic wrap and refrigerate for at least 1 hour and up to 2 days. Remove plastic wrap and roll out dough on a lightly floured surface to a 12-inch circle. Transfer crust to a 9-inch pie plate. Fold over any excess dough, then crimp edges. Prick crust all over with a fork. Chill crust for 30 minutes. While the dough chills, preheat oven to 375 degrees. Line chilled crust with aluminum foil and fill with pie weights or dried beans. Bake for 25 minutes. Remove foil and bake until very pale golden, 5 to 10 minutes longer. Remove from oven and reduce temperature to 350 degrees. While the crust bakes, melt butter and chopped chocolate in a small saucepan over low heat, stirring until smooth; set aside to cool. In a large bowl, whisk together cooled chocolate-butter mixture, corn syrup, eggs, sugar, cocoa powder, bourbon, and salt. 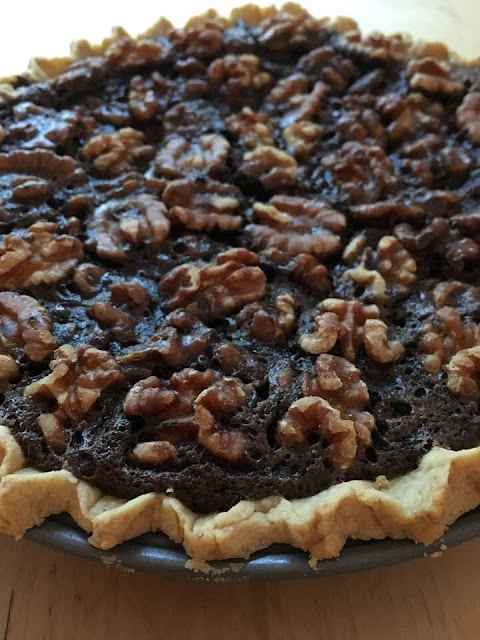 Spread the walnuts in the crust and pour chocolate mixture over top. Transfer to a large rimmed baking sheet. Bake until the filling is just set when the pan is jiggled, 30 to 40 minutes. Remove pie from the oven and cool completely on a wire rack before serving.